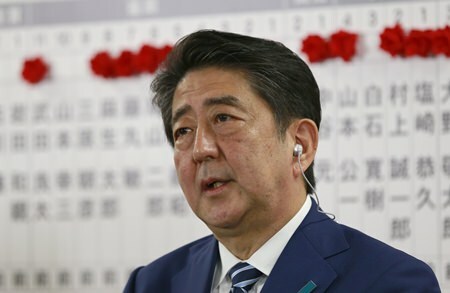 Tokyo (AP) — Japan’s ruling coalition appeared headed to an impressive win in national elections in what would represent an endorsement for Prime Minister Shinzo Abe’s nearly five-year leadership. A victory would boost Abe’s chances of winning another three-year term next September as leader of the Liberal Democratic Party. That could extend his premiership to 2021, giving him more time to try to win a reluctant public over to his longtime goal of revising Japan’s pacifist constitution. In the immediate term, a victory likely means a continuation of the policies Abe has pursued since he took office in December 2012 — a hard line on North Korea, close ties with Washington, including defense, as well as a super-loose monetary policy and push for nuclear energy. Japanese media projected shortly after polls closed Sunday that Abe’s LDP and its junior partner Komeito might even retain their two-thirds majority in the lower house of parliament. In unofficial results in the early hours of Monday, the ruling coalition had won 312 seats in the 465-seat lower house, exceeding a two-thirds majority at 310, and other parties had 143 seats, Japanese public broadcaster NHK said. Final results may not be tallied until Monday. Abe’s ruling coalition already has a two-thirds majority in the less powerful upper house. Having the supermajority in both houses virtually gives them a free hand in pushing even divisive policies and legislation. Abe’s support ratings had fallen to around 30 percent in the summer after accusations of government favoritism to people connected to him, sparking talk that he might be vulnerable as leader of his party and prime minister. Abe dissolved the lower house less than a month ago, forcing the snap election. The lower house chooses the prime minister and is the more powerful of the two chambers of parliament. Analysts saw Abe’s move as an attempt to solidify his political standing at a time when the opposition was in disarray and his support ratings had improved somewhat. His plan was briefly upstaged by the launch of a new opposition party by populist Tokyo Gov. Yuriko Koike. But initial excitement faded and Koike herself decided not to run for parliament. NHK projected that her Party of Hope so far has won just 49 seats. Projections indicated that another new party, the Constitutional Democratic Party of Japan, could outpoll the Party of Hope and become the biggest opposition grouping. The Constitutional Democrats are liberal-leaning, while both the Party of Hope and Abe’s Liberal Democratic Party are more conservative.